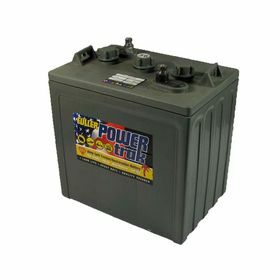 POWERTRAK 251Ah 6V Semi Traction Battery US-145. This lead acid battery us engineered and proven to provide the fastest cycle-up to full rated capacity, and have the highest total energy delivered over the life of the battery. POWERTRAK 251Ah 6V Semi Traction Battery US-145 is one of the best flooded lead acid battery on the market and is built from a premium quality battery cell design, hand-made construction and with precise attention to details.